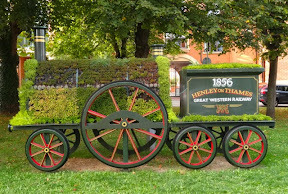 Last week Henley held its very popular Literary Festival. We are lucky to have many splendid locations here to stage the many events in. From the beautiful Bix Manor to the iconic Kenton Theatre, the authors had a wide choice to talk about their latest books. On Wednesday I went to the fascinating talk given by the current Countess of Carnarvon who lives in Highclere Castle (the location of Downton Abbey). After the first episode of the TV series the Countess mentioned that the dinner table cutlery had been laid out incorrectly. So as a surprise, at the end of her talk, the owner of Bix Manor - dressed as a butler - walked up to the Countess, carrying a tray full of cutlery, and proceeded to lay a table under her watchful supervision. The little scene ended with her being offered a glass of champagne. Which was gracefully received. 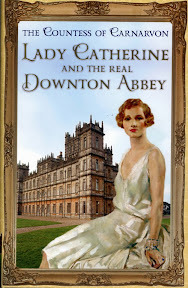 The Countess talked about her new book which relates the story of the beautiful American heiress who married the Earl of Porchester in 1920 and came to live in Highclere Castle. One of the more interesting talks I saw at the Kenton Theatre was by Dame Stella Rimington, the director general of MI5 between 1992 and 1996. She spoke of the struggles she went through juggling her career and bringing up a family. She said she regretted missing out on 'sports day' and school plays because of dramas in the office. Dame Stella is now a thriller writer and I can well imagine what a host of material she can call upon for the detail in her plots. Another interesting author I listened to was Barry Norman, one of Britain's most prominent film critics, who claims to have seen more than 12,000 movies. Controversially he claimed the industry made films for young people who have the attention span of 'fruit flies'! "Great films require great plots" he said, "but too many now fall into the trap of 'crash, bang, wallop effects". "You can't make a film on an idea, you need a great story, but sadly a lot of films today rely on special effects to give a short-lived burst of excitement". At Christchurch on Saturday morning my young friend came with me to hear one of my favourite TV presenters, Lucy Worsley, talk about murder! She's a really good speaker, and with that wicked elfin-like smile easily captures the audience's interest. Her current TV series entitled ' A Very British Murder' was also the subject of her talk. Doctor Worsley is the chief curator of the Historic Royal Palaces and has a real ability to make history fascinating. A wonderfully lucid speaker her book takes a look at our fascination with murder most foul. (I liked her new hairstyle too). 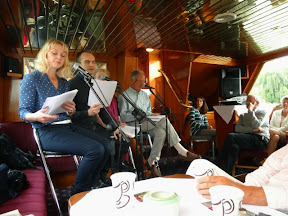 To end the day Val joined us on The Waterman cruiser for a one hour trip up and down the river whilst listening to poetry readings. This was the scene on the boat. 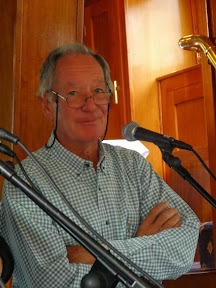 One of the excellent readers was former BBC newscaster Michael Buerk. 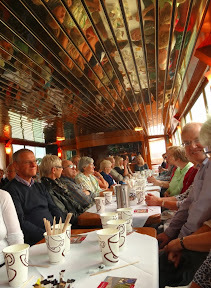 And here is a view looking down the cabin of a very attentive audience. A really nice afternoon. As we left I turned to see or craft moored behind a whole variety of boats cheek by jowl at Hobbs boatyard. Up early on Monday to catch the train to London and the Mall Galleries where I helped the committee to select the miniatures for the soon to be staged annual Royal Society of Miniature Painters exhibition. Apart from the Members and Associate Members work it was gratifying to see so many entries from non-members. As one of my tasks that day was to select the winner of the Mundy Sovereign Award for the best portrait, I was delighted to find that my favourite portrait came from a non-member. The quality of work submitted this year reached an all time high we all thought. As I had parked my car at Vince and Annie Hill's house near Shiplake station I called in to have a drink with them when I reached home in the evening. Good to see that Annie's a lot better after her recent spell in hospital. This last week I've completed two pencil portrait drawings, but as they are to be Christmas presents I'd better not put them on my blog at this time. All the preparations for my November Exhibition are nearly complete. I can't begin to work out how many hundreds of hours I've spent on this so I hope it's all worth it. My young friend has made a sizeable contribution too with her superior computer knowledge. I think I've chosen a really good company to print and produce my catalogue as the proofs they supplied, when I drove over to Kidlington the other day, are superb. Now I have an apology to make. 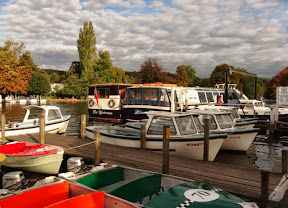 In a recent blog - 'Glorious Boating Weather' - where I reproduced a poem about a husband's tale of 'Fifty shades of grey' I was told, incorrectly, that it was written by Pam Ayers. In fact it was by John Summers, who, very kindly pointed out my error. Sorry John. (It was really good though, and made me laugh out loud). To end this week's blog I'll show you something I've never seen before (but should have). It's a formal tribute to our train station and I can't believe it's been invisible to me for so long. Maybe I need new glasses!